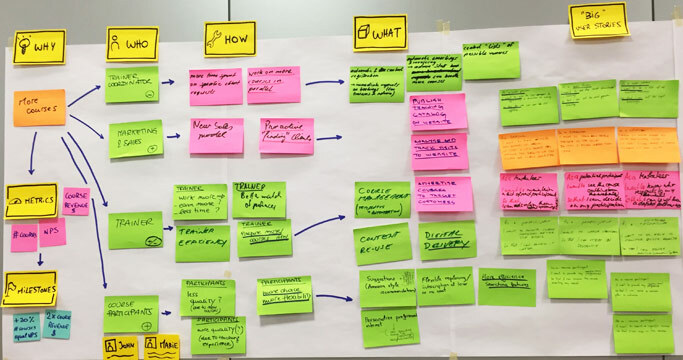 In this blog post I would like to raise awareness about Impact Mapping – a game-changing method I learned last week on a training with Jef Cumps. This method can significantly improve the way many teams and organisations build products. This blog post describes the way how to use this technique. 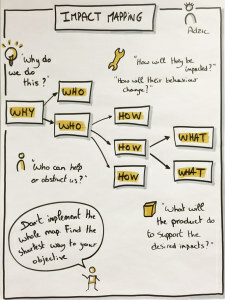 Impact mapping is a planning technique that helps companies from getting lost while building their products by clearly communicating assumptions and business objectives in order to make better roadmap decisions. This tool is useful for all people involved in building software products like Product Owners, Product Managers, Scrum Masters etc. This method will bring you usability and speed to proven product- and project management strategies. It helps you to reduce waste and to enhance collaboration by creating a big-picture of your business that teams can use to prioritize their product backlog by business value. Finally, it helps you that the right business goals will be achieved and that unrealistic features will be kicked out of your backlog before they cost too much money. In the first step you have to answer one “simple” question: Why do you want this product? As a feature should have a direct impact to your business model, it’s important to know the main objectives for the product. So you should clearly agree on measurable goals by gathering the why-items. For example you want to drive more sales in your online shop or you want to increase the number of reviews on your platform. Understanding your business is the most essential thing! Assumptions are just worthless without understanding the Business Model because they are out of context. You might be able to generate more money without understanding the business – but only one time and that’s it. Customer might not come back! Therefore you need to be able to measure if the feature has a long-term impact on your product. Who can help or obstruct us? Next, you list the user roles who will be impacted by the objective. This allows you to discover and formulate the desired changes in behavior for reaching it (Persona’s are often used to create such tangible ‘example users’ in order to facilitate communication and requirements understanding). Keep in mind that there might be several personas such as coordinators, marketing guys, accounting staff or the end-customer. That depends strongly on your product. Identify those people that can help you reach your objective, obstruct you in reaching it, or that will be impacted by the new product. Once you have defined the user roles you need to find out how they will be impacted and how their behavior will change by your goals. Let’s say your goal is to generate more reviews for your articles in your online shop. How would your daily visitors be impacted if they would see more reviews on your listed products? How would your call center be impacted by more reviews? An assumption would be that call center would receive less phone calls because the new reviews already answered the customer´s question. What will the feature do to support the desired impact? Now you start to write vague product features (what) that are needed to support the desired impact. Don’t write any solution on this story as this is still a big and vague story. Once you collected these items on your product backlog you can decide and prioritize what is the most important valuable piece of software you want to ship! Next, you can start splitting (the most important of) these big product features into user stories to create a healthy Product Backlog. Don’t implement the whole map. Find the shortest way to your objective! Don’t hesitate to kick Items out of your product backlog if there is no fit to none of your goals. I would even say kick the ones with the lowest value as there might be other stories with much more value pointing to another goal. In the end you will always have a Product Backlog prioritized by business value. Don’t put too much in it. There is nothing worse to have a backlog for the next 6 month. Just concentrate on the next logical step by pulling the item with the highest business value. 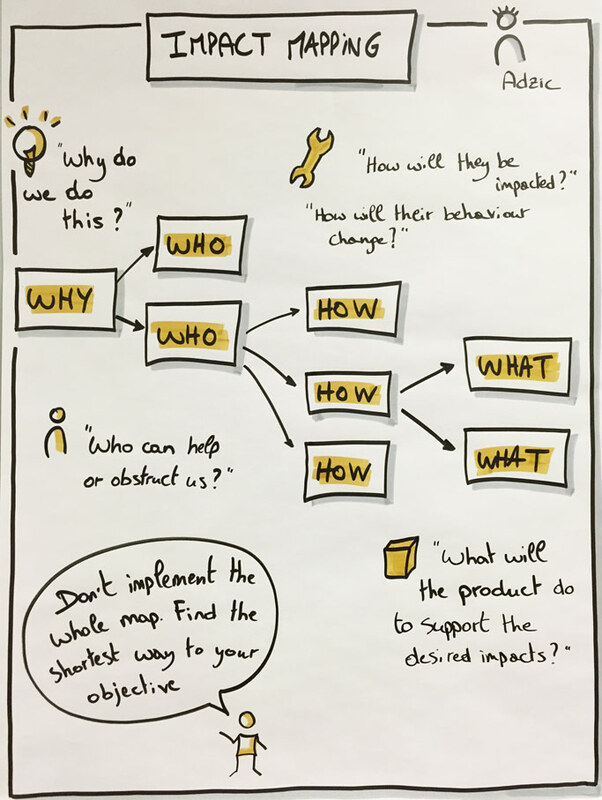 The Impact Mapping tool is the right tool to evaluate your assumptions as this map will trigger the right discussions within your organisation. Make it visually and beautiful in your office to get more benefit out of it. If you want to learn more read this book about Impact Mapping! Did you like the post? Send me a feedback. I would love to hear from you! Dominic, thanks for your post. I’m wondering, if you can use this technique to decide, which features to include into a minimal viable product, and which not to include. Hi Dmitri. Glad that you liked the post! 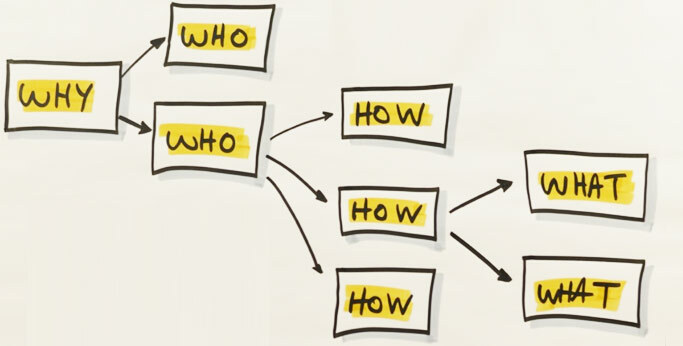 And if you are still (yes, I know, 2.5 years passed) interested in customer journey mapping and impact mapping, we have both of the in UXPressia: https://uxpressia.com. Would love to hear your feedback anyway! Maybe this is something that you find useful. I’d really like to get your feedback on it. Hi Roman, Thanks for reading and for sharing this link for us! Keep up blogging! Hi Dominic, thanks for sharing your experience with using Impact Mapping. One thing that I find a bit confusing in your explanation is the example you chose, especially the goal of “more courses” with the metrics, e.g. “higher nps”. Is this really a business goal? Shouldn’t “Higher NPS” be a goal of its own? 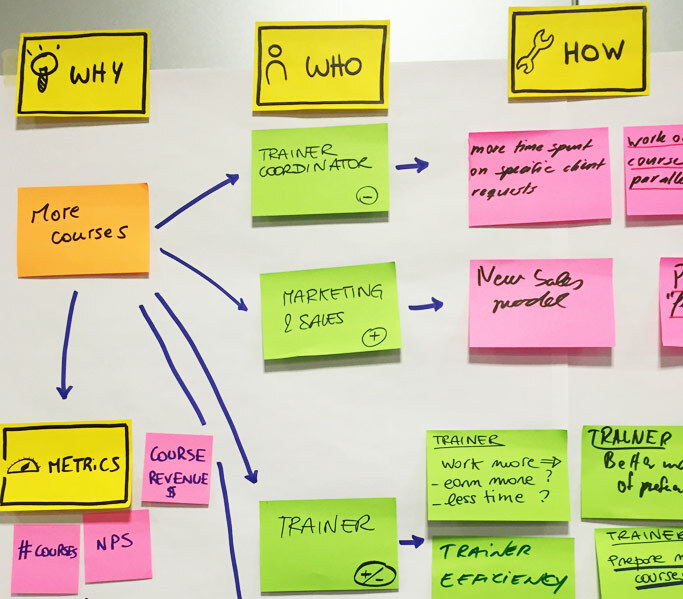 and by doing an impact mapping for this goal you could end up with different ideas how to do this and one of them could be “more courses”, but this could also be “faster response to customer queries”, “better quality of products”, etc. What do you think? Hi Jakub, Thanks for your comment. Really appreciate your input! In my example I use “more courses” because I wanted to make people understand easily the big advantage of “Impact Mapping”. What I might missed in my article is the fact that you can actually use several metrics in order to derive your actions. So as you say, you could complement the map with with an “Higher NPS”. Probably you will get similar “big stories” out of it. It’s even recommended that you run this map with more than 1 goal because this will generate a bigger and clear image. Did you already try it out? Would love to hear some experiences from others! Hi Anton. Great that you publish another resource. Just use the picture and please add a credit to the original post so that your readers can read further information about the topic. Thanks.